While the Bay Area has its share of izakayas (pub-like hangouts ideal for sipping, snacking, and relaxing), Ippuku is a place apart. The dark, dazzling raw concrete/recycled-wood setting features a traditional bamboo-screened, lantern-lit kotatsu (dining area) with low tables and comfy footwells. The bar offers 42 distinct varieties of draft and bottled shochu on the rocks, cut with hot or cold water or served in a mix-it-yourself highball. 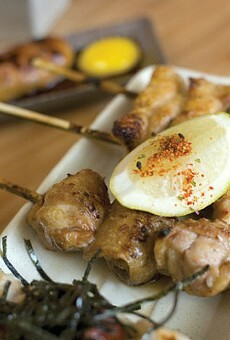 And skewered variety meats, not raw fish or sizzling steak, is the specialty of the house. The heart, liver, tail, and gizzards of pasture-raised Soul Food Farms chickens are rich, smoky, and delectable, but don't pass up the Berkshire pork belly with sugary soy paste; the tender, juicy Wolfe Ranch quail; half a dozen crunchy little head-to-tail smelt; or (for the vegetarians) the buttery corn on the cob or the yuzu-jazzed shiitakes. Other unique nibbles include bitter melon tempura, bacon-wrapped mochi, avocado sashimi, and cream cheese with skipjack tuna innards (an acquired taste). The maccha sundae (green tea soft serve with mochi, red bean paste, and tempura flakes) makes a perfect over-the-top meal-closer.